as I admire the black and white patchwork that our fields start to become. of so much that underpins who I am. This quote (above) that I saw on Twitter this morning made me smile. "...The black and white Fresian cow is a symbol of so much that underpins who I am." 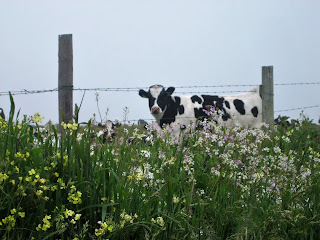 Probably anyone reading this blog knows how much I like cows. Black and white cows - the Fresian ones - are my favorite. I had never thought they were "a symbol of so much that underpins who I am." That sounds so lofty! Seeing cows gives me a warm, comforting feeling because, when I was a kid, black & white cows in the fields outside town were the first sign that we were almost to Lynden. Again, if you know me, you've heard this already, but I'll write about it for posterity. :) My dad was a chaplain in the Air Force when my brothers, sister, and I were growing up. We moved a lot. The moves were rather traumatic for us. (Maybe traumatic is too strong a word. Upsetting? Seems too weak.) One wonderful thing about the moves was that nearly every time, as we were driving across the country to our new home, we'd have a long visit in Lynden, Washington, where my dad grew up on a dairy farm. There were many other dairy farms in the area, hence the cows. As we approached Lynden, we'd see (and smell) the cows in the fields, then we'd drive through two graveyard plots, one on each side of the road. And then...Lynden. For me, and I think for my siblings, Lynden felt like a little slice of heaven. My dad came from a family of 8 kids - 6 boys and 2 girls - so we had 7 aunts & uncles and around 30 cousins, most of whom lived in or near Lynden. I know I look back with rose-colored glasses, but it seemed idyllic to me. A favorite memory is when I was sitting on the steps to the living room at one of my aunt's houses. She was hosting the family coffee time after church. As the aunts and uncles walked by, they would reach down and rustle my hair, or pat me and say hello. That memory comes to my mind when I hear Louis Armstrong singing "What a Wonderful World." "...I see friends shaking hands saying how do you do; they're really saying I love you." I think that feeling I get from seeing cows is the joy of belonging. I felt I belonged in Lynden. I fit right in. My brother settled there as an adult, married, and raised his children there. He told me how good it felt that, as he drove from town to his home, he waved to other drivers over and over. They knew him. He belonged. So maybe you could say those black and white cows are "a symbol of so much that underpins who I am." I still often say I'm going "home" when I visit Lynden, even though I only lived there one year of my life. Where -- and with whom -- I belong has expanded beyond Lynden and my family there. Yet those cows are still a symbol that I belong, I am loved. Bless the black and white cows. What makes you feel that sense of belonging? What symbolizes much that underpins you?